Origin: Artist's Studio. This wonderful plate is both playful and utilitarian. The plate is a combination of blown, lamp worked and sheet glass made at separate times, layered and fused into each other. These form one complete piece of glass. Afterwards it is decorated with gold, reheated and shaped. Available only in 18" diameter. Done in various colors. 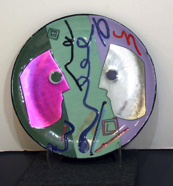 This plate was the first piece I made after my first cervical spine surgery which corrected a paralysis I had in my right arm. So, it very significant to me. This is also made as a table top.